Beer lovers, get hopping: Craftober is here! All this month, Tampa Bay taps into its growing reputation as a top craft beer community in the U.S. by marking Craftober, a celebration of the local craft beer scene. The party started Oct. 1 and includes some of Tampa Bay’s biggest beer festivals. Book your trip now to qualify for Craftober awesomeness. Visitors will find plenty of special offers, limited-edition T-shirts and loads of events at local breweries. And alongside Craftober, Tampa Bay will have a howling good time on weekends leading to Halloween. Treasure awaits in Tampa Bay – in cans, bottles and on tap. Celebrate Oktoberfest Tampa with German cheer, dancing and, of course, beer in downtown’s Curtis Hixon Waterfront Park on the Hillsborough River. Oktoberfest Tampa 2016 is a time to hoist a stein and unwind with new friends. You’ll even learn new customs and sing along to live music. Get your fill of alphorn players, Schuplatt dancers, authentic Bavarian food and outrageous Oktoberfest games! Got a fuzzy lip or chin? Be sure to sign up for the mustache and beard contests. Help tap the first keg Friday, October 7, as the doors open on Tampa Bay&apos;s largest Oktoberfest. Drink with the fishes amid the cool blue confines of The Florida Aquarium and sample dozens craft beers. Admission includes unlimited beer sampling from Pepin Distributing and food from local Tampa Bay area restaurants. There will also be live music from 8 p.m.-11 p.m. and access to all the Aquarium’s exhibits. Tickets are $50 in advance, $60 at the door, $75 for VIP. Craftober participants get $5 off admission. 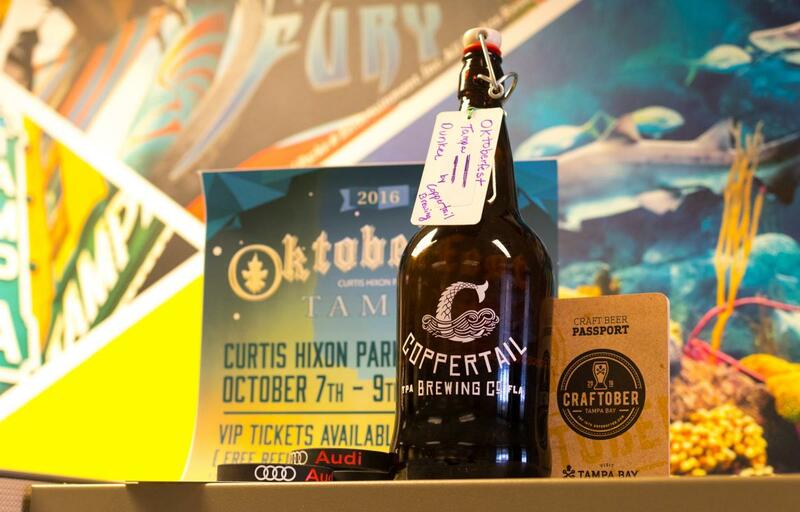 Tampa Bay’s historic, Cuban-infused Ybor City neighborhood has become the latest hotbed for craft brewing with local legends like Tampa Bay Brewing Co. and newcomers Coppertail Brewing and Rock Bros. Brewing. Twenty Ybor pubs will join the German-themed fun with food, music and beer from 4-8 p.m. Tickets are $25 in advance, $35 at the door. Purchase them at Crow Bar, 1812 North 17th Street.